Yesterday, the third finals match of the NBA playoffs took place in the Quicken Loans Arena in Cleveland. The Golden State Warriors had to accept defeat against the Cleveland Cavaliers – we can thus wait with bated breath for the match next Saturday. We analysed which US publisher had the highest visibility in the Google News Box during the first Finals match until yesterday. After three matches it is not possible to anticipate yet which team is going to win the playoffs. 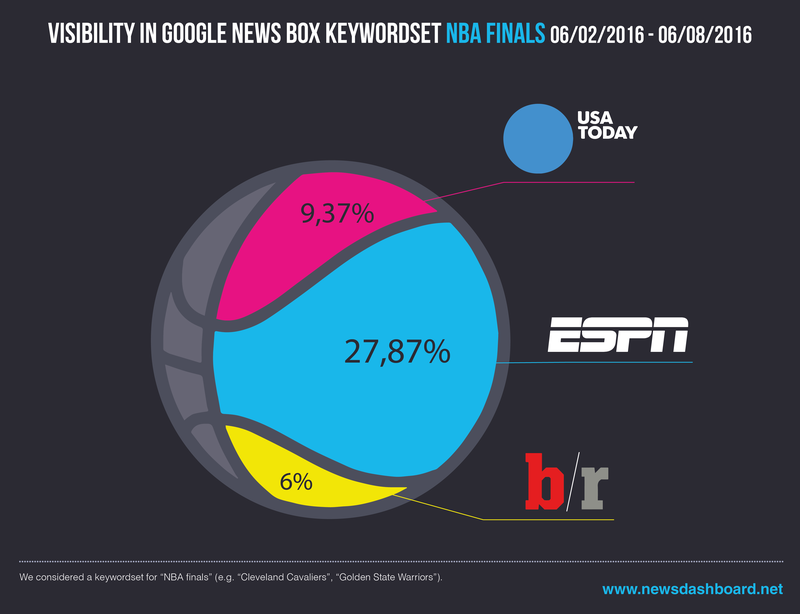 There is a clear winner regarding the highest visibility in the Google News Box though: ESPN prevailed for all analysed sets of keywords and led the field constantly. Espn.go.com reaches by far the highest visibility. 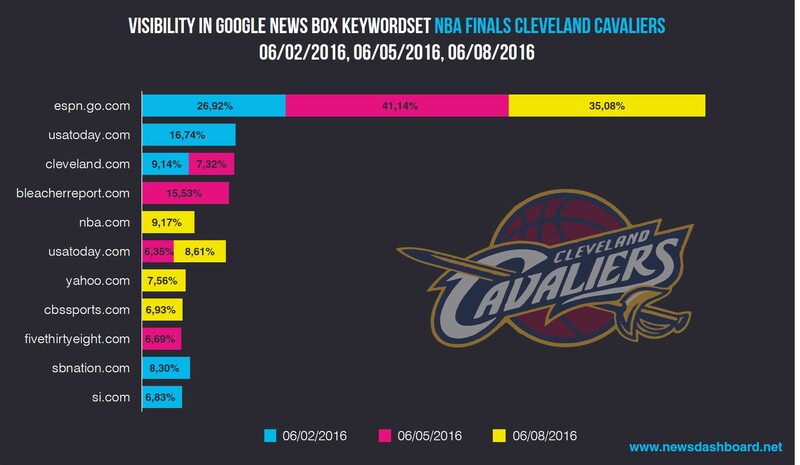 The first chart shows the top 3 for the overall set of keywords for the Finals (keywords like Golden State Warriors, Cleveland Cavaliers, etc.) for the time between June 2nd and 8th 2016. ESPN clearly reaches position 1 with 27.87% and is therefore way ahead of the second place (USA Today with 9.37%). Bleacher Report made it to the third position with 6%. Apart from the top 3, the chart 2 shows seven more rankings for the visibility in the News Box. The numbers are relatively close together, with SB Nation and The New York Times reaching more than 5%. Cleveland.com reaches 4.46%, and The Mercury News, FOX Sports, nba.com and Sports Illustrated mark positions seven to ten with more than 3% each. Top 10 for visibility in the News Box at a glance. Let’s have a closer look at the visibility numbers for two special sets of keywords. On the one hand, chart 3 shows the top 5 for the set of keywords “NBA Finals Cleveland Cavaliers” for the past three Finals games. ESPN leaves the competitors far behind and manifests its top position here, too. Yahoo, CBS Sports and FiveThirtyEight join the game and re-shuffle the pack for this special set of keywords. The figures for visibility in the Google News Boxes for the past three match days. 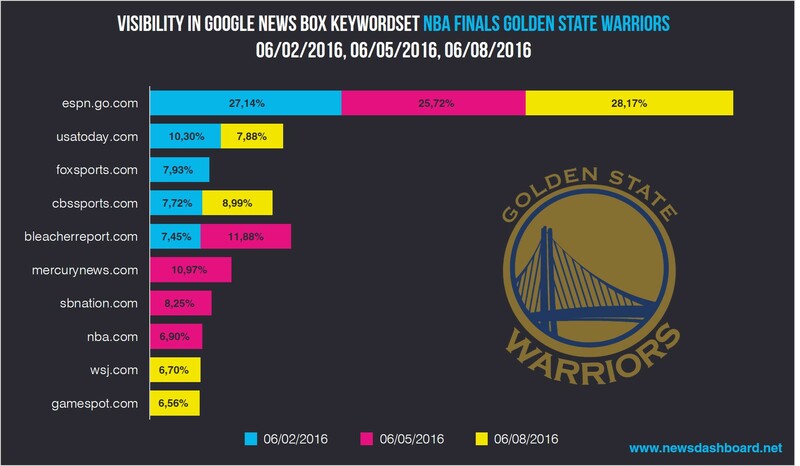 We did the same analysis for the set of keywords for “NBA Finals Golden State Warriors” (see chart 4). It does not surprise, that ESPN is leading again – congratulations! Of course we are also happy for all the other mentioned publishers that made it to the top 10 or top 5. For the set of keywords for the Warriors there are two new competitors in the top five: The Wall Street Journal and GameSpot with more than 6% visibility in the Google News Box each. Two new players enter the field. 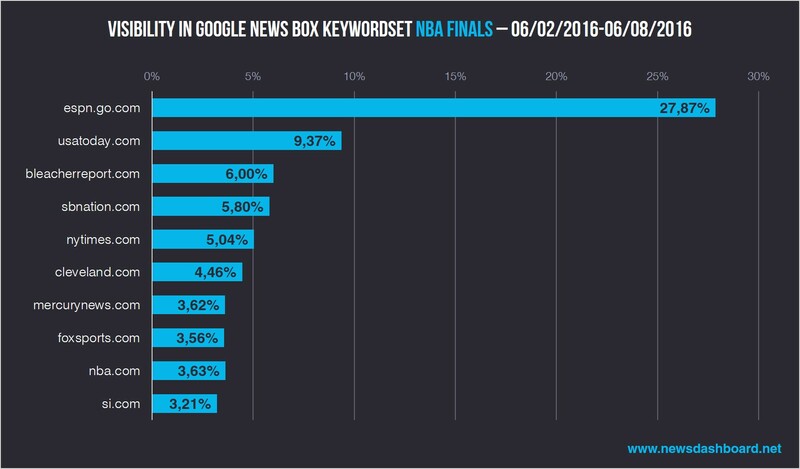 To put it in a nutshell: ESPN has reached the highest visibility in the Google News Box for sets of keywords around the NBA Finals after three match days. USA Today and Bleacher Report also made it to the podium. There is more fluctuation on the other positions though. We are excited to see how the tables will turn after the next Finals matches – and, of course, to see which team wins the Playoffs. In the admittedly modified words of NBA: THIS IS WHY WE ANALYSE.